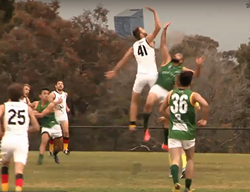 In the wet and drizzly conditions of what one would describe as a traditional Melbourne morning, the German Eagles prepared to face the Shaheens from Pakistan in their first round encounter of Division 2. With the Germans possessing the clear height advantage over the Pakistani side, it was poised to be a battle of the in and under players to give first use of the football to their respective teams. That’s exactly how it panned out as the match progressed. From the first bounce, the intensity and ferocity of the match was apparent for all to see, with every stoppage and disputed ball a hotly contested affair. 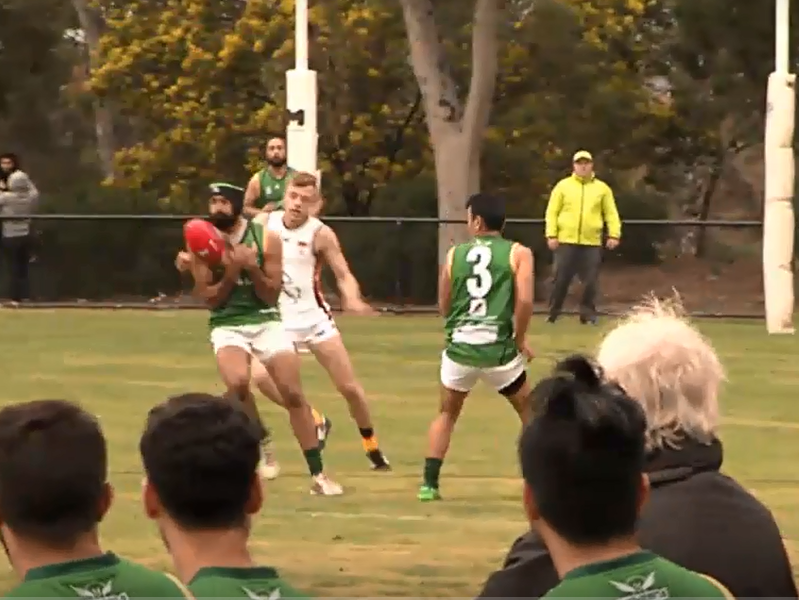 The Eagles raced out of the blocks and were in scintillating form as they kicked out to an early lead thanks to Philip Evermann who booted two first quarter goals to give the Eagles a healthy 17-point lead heading into the first break. As the rain began to really pelt down in the second quarter, it was up to the smaller players for both sides as the ball would be spending more time in dispute or on the ground as the conditions became more trying. The Shaheens began the second quarter with a sense of desperation as they dominated the possession early, with fierce tackling pressure and having the ball inside their attacking 50 repeatedly, yet they were unable to capitalise on this as the German defence was rock solid. No sooner had the ball entered their 50, it was immediately dealt with and the pressure released by the trademark efficiency of the Eagles. Although the Pakistanis put up more of a fight, they were unable to impact the scoreboard and the Germans opened up a sizeable 30-point lead coming into the main break. The third quarter began right where the second half had left off with the intensity and attack on the ball still extremely high, however the deluge of rain was making the skill level drop as the ball was increasingly becoming hard to handle. Yet again, it was the German ruckman pairing of Fabian Cordts and Johannes Orlowski feeding the midfielders with first use of the football. The midfield lead by Robert Macher and Christoph Odenthal drove the Eagles forward and delivered a good service to the forwards, making it increasingly taxing on the Shaheen backline. The testing conditions did not come without casualties however, as Pakistan suffered injuries to key players with Zain Hamid and Daneyal Khan taken from the ground with suspected ankle injuries. It was an action packed third quarter, however there was minimal scoring as the Eagles went into the final break with a 37-point buffer. With the words of their coach, Mark Woods, still ringing loudly in their ears, the Eagles came out full of energy and hard running, and were relentless in both attack and defence, forcing the ball forwards at all costs. This approach was too much for the depleted Pakistani side to handle and they wilted under the sustained Eagles pressure. With little to play for other than pride, still the Pakistan side did not give in, creating numerous surges deep into their forward line. But for the Shaheens there was just no ability to score and pay off their hard work. The stellar defensive unit of the Germans, who had been ever dependable continued to repel the advances of the Shaheen attacks. They just failed to cleared the ball from defence, when one good kick to get the ball down the ground and cause a secondary stoppage would have served them better. They could have then reset their defensive structures and get numbers behind the ball. The Eagles ran out as deserving winners by a solid 68 point margin and showed why they are favourites to take out the Division 2 title.